Ten years later, we look back at the greatest college football title game we've ever seen through the words of those who lived it. Before Reggie Bush was discovered receiving something more than a scholarship, before Vince Young went from All-Pro to all done, before Pete Carroll even sniffed a Super Bowl, there was a game to remember. Ten years ago, No. 1 USC and No. 2 Texas played in what has become college football's greatest championship game. Never mind the sample size only goes back to 1998 when the Bowl Championship Series started these arranged marriages in title games. Please stow your arguments about Auburn-Florida State from a couple of years ago. For starters, those teams weren't ranked 1-2 all season. The BCS did us a favor on Jan. 4, 2006. It matched two teams loaded with stars in the Rose Bowl. It gave us two Heisman Trophy winners and more than 60 future NFL Draft choices (including 2005 redshirts). There were eight past, current or future head coaches on the sidelines that night. USC's entire starting offensive line played in the NFL. Seventeen of Texas' 22 starters made it to the pros. 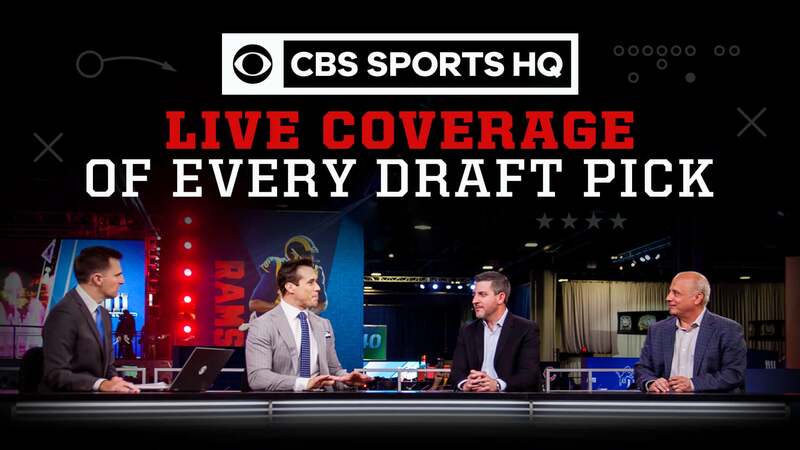 They were teams that played perfect regular seasons and required another 59 minutes and 41 seconds of postseason football to find out which was better. "Nobody ever saw No. 1 and No. 2 go at it like we did," said Vince Young, the Texas quarterback who shocked the Trojans and the world with the winning touchdown run. "I've probably watched it 100 times or more. But it feels like your first time seeing it." 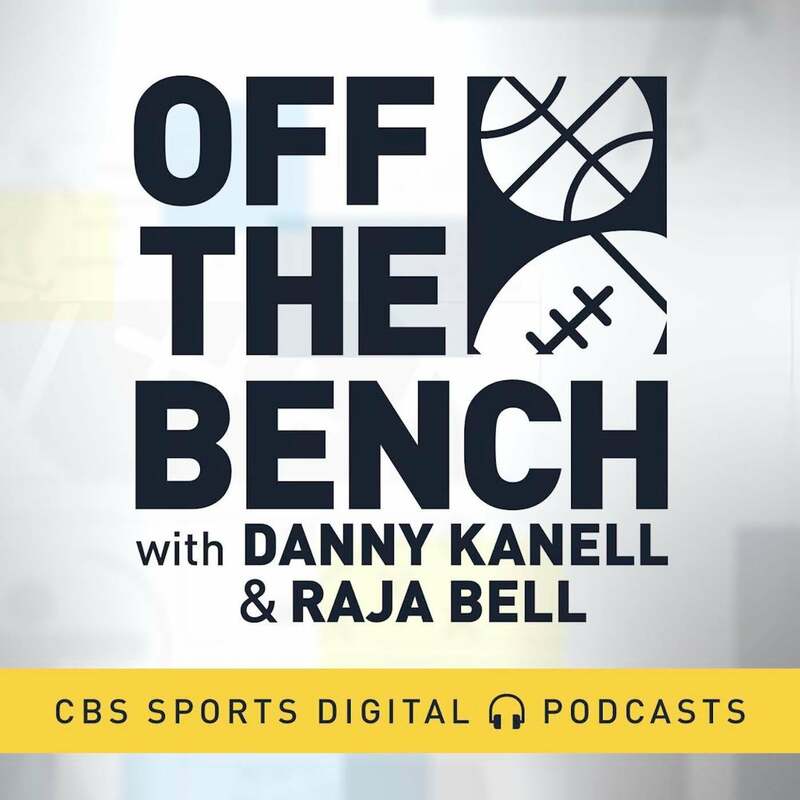 With that greatness in mind, this past year was spent assembling an oral history of that season and game from those who played and coached it. USC-Texas, two name brands across all ages staged a game for the ages. "To my way of thinking this was the best bowl game in history," said Austin American-Statesman columnist Kirk Bohls, "because it matched two unbeatens in the most sacred venue in college football, each of whom averaged over 50 points." It's true. Well, almost. While Texas averaged just under 51 that year, USC came in at a tick above 49. Nobody could keep up with either of them. Except each other. It was a championship game that was destined to happen. It's a game that's hard to forget. "They were two of the most powerful programs in college football," said Steve Sarkisian, USC's co-offensive coordinator that year. "The drama with the Heisman vote, all the movie stars on the sidelines. It felt like the Super Bowl. You could easily argue it was the greatest game." "We knew we wanted to play the best, and USC was the best." To a man, the Longhorns said beating Michigan in the Rose Bowl the year before set the stage. 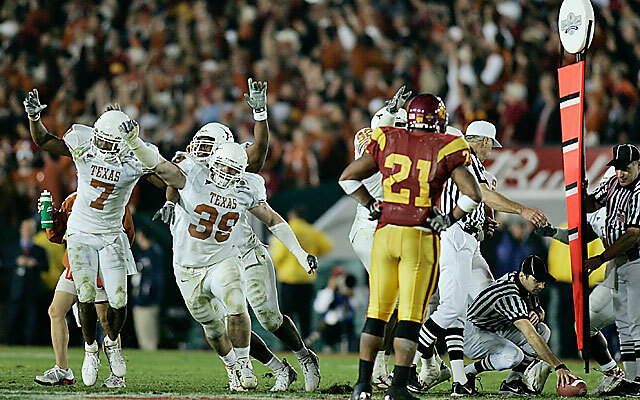 Texas finished the 2004 season 11-1 after defeating Michigan 38-37 in Pasadena but felt like there was unfinished business. A crushing 12-0 loss to Oklahoma in October had kept the Horns out of the championship chase. Texas coach Mack Brown: We said after the Michigan game, 'This is just preparation for next year.' That's all it is. Young felt especially fortunate to be contributing in 2005. He missed the Michigan game with a broken ankle. The following spring he was forced to go to Austin Community College to improve his grades. Selvin Young: I was half going to class, half not going to class. They actually pushed me out. I had to fight my way back and get my academics back right. I made the dean's list. Young went on to rush for what was then a career-high 461 rushing yards in 2005. But not until he formed a bond with trainer Kenny Boyd. Selvin Young: I had a cast on my leg with 11 screws. I'm a regular person going to community college, trying to make Bs so I can get back in college. I would have to find places to go work out and train. Kenny Boyd would meet me at the basketball facility. I'd get the code and go in there and train, maybe about a hundred straight nights. 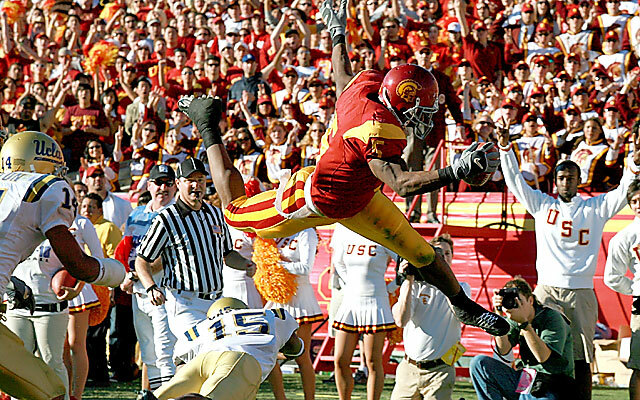 USC came into 2005 as a favorite to become the first team to win three consecutive national championships. By that time Pete Carroll had taken over the Pac-10 and the country by throwing up a recruiting fence around Southern California. Brown had done the same in the state of Texas. In 2005, he was in the process of winning at least 10 games nine times in 16 seasons. Texas' best regular-season challenge came in an early September win at Ohio State, 25-22. On Oct. 15, USC played at Notre Dame in a game that remains one of the most hyped in the series' history. It wasn't just the two rivals who have been playing since 1926. It was the build-up. Notre Dame was desperate to be relevant again with Charlie Weis in his first year. Two-hundred fifty private planes reportedly flew into the South Bend airport that weekend. The whole town was dripping with anticipation -- and celebrities. The game was a happening starting with Weis admittedly allowing the Notre Dame Stadium grass to grow in order to slow down the swifter Trojans. Ruel: I was thinking, don't they get it? You can slow fast guys down with grass but you slow slower guys down with grass too. USC went on to one of the biggest wins in its history. Matt Leinart hit Dwayne Jarrett on a late fourth-and-8 play to set up the famous Bush Push. The Trojans survived 34-31. USC quarterback Matt Leinart: It was a sluggo route [slant and go]. The original call was an option route to our tight end. We just needed to get 8 or 9 yards. I remember Sark telling me, 'If you see any blitz look, anything at all, check to sluggo. That was our bread and butter. We lived and died by that play. Then it just became a one-on-one ball with Dwayne Jarrett. He was 6-5. He was my favorite target for a couple of years. We got lucky that day. On the flight home, Ruel noticed the man he had yelled at during the game sitting with the traveling party. Sarkisian: I remember that Monday we had our normal team meeting and the players wanted a players-only team meeting. They basically said, we're not playing good enough. We're not playing up to our standard. Undefeated, won 30 straight games, most teams would be celebrating. These guys were upset. Texas had already identified USC as a distant target. None of that one-game-at-a-time stuff. The two teams were so far ahead of everyone else they remain the last preseason 1-2 teams to meet for the national championship. Texas tailback Jamaal Charles: We looked at USC like they had an NFL team, basically. Vince Young: We knew we wanted to play the best and USC was the best. We did everything in our power to get there. Selvin Young: We actually felt like in practice, we were going against the best people we played against ever … The people we played during the weekend were nowhere near what we played during the week. After Ohio State, the Horns won the next eight games by an average of more than 37 points per game. Selvin Young: We had this little chant. The quarterbacks were touchdown makers. The running backs were ankle breakers. The defensive backs were money makers. For motivation going into the Texas A&M game, Brown thought back to his time playing for linebackers coach Bill Parcells at Florida State. Brown: Coach Parcells called and said, 'Hey, I think you're in trouble. You're getting fat like the rat eating the poison cheese.' We put pieces of cheese in every locker. At halftime of the A&M game, we weren't doing very well. All the sudden you don't watch what you eat, you get sick, you die. At halftime, we're not going to die. The Longhorns won 40-29 to complete a 12-0 regular season. Meanwhile, Leinart and Bush owned L.A. that year. Leinart won the Heisman in 2004 then torched Oklahoma in the BCS title game. His senior year in 2005 was the ultimate farewell tour. Leinart was universally loved for spurning the NFL and keeping USC's repeat hopes alive. Sarkisian: When he came back for his senior year he was on top of the world, but I felt like I was one of the few people who could keep him humble. But for as much as Leinart was loved, Bush was bigger, better. The regular season ended with an epic 66-19 torching of UCLA despite, as Sarkisian tells it, Leinart crying through much of the first quarter due to the emotions of playing in his final home game. "We were running the ball on every down trying to get him back in order," Sarkisian said. Watching the Trojans that day, it was hard to imagine any team playing better. They had won 34 in a row. Bush was completing a season in which he rushed for 1,740 yards and accounted fora then-Pac-10 record 2,890 all-purpose yards. Sarkisian: We were clicking on every cylinder you could think of. Indeed, nothing had phased the Trojans. With no NFL team in Los Angeles, they were the kings of the city. Will Ferrell showed up at a practice unannounced, catching a bomb from Leinart. That year, a highly touted recruit named Tim Tebow drank it all in a raucous locker-room scene during an official visit. Sarkisian: I remember LenDale White scoring a touchdown and flipping the ball to Snoop Dogg in the back of the end zone. I remember being in our locker room after the game there's Anthony Kiedis [of the Red Hot Chili Peppers]. There's The Fonz. [In 2014], Adam Sandler is my locker room before the kickoff of ballgames. Meanwhile, Vince Young was just as good, if not better than Bush, becoming perhaps the best player in Texas history. At 6-foot-5, 230 pounds, V.Y. had the size, arm, speed and attitude to become the difference maker in a program that had gone three and a half decades without a championship. Twice he ran for 1,000 yards in a season and all told he accounted for 81 touchdowns in his career. That 2005 season Young became the first player to pass for 3,000 yards and run for 1,000 more. Sarkisian: We knew he was a big physical guy. We knew they didn't run a lot of plays. They didn't have a big playbook. He just kind of made their plays work. Selvin Young: When we came in the huddle, he'd laugh, we would joke. That lasted a couple of drives. [Then he'd come] in the huddle and say, 'Let your nuts hang, b----.' That would make you laugh. 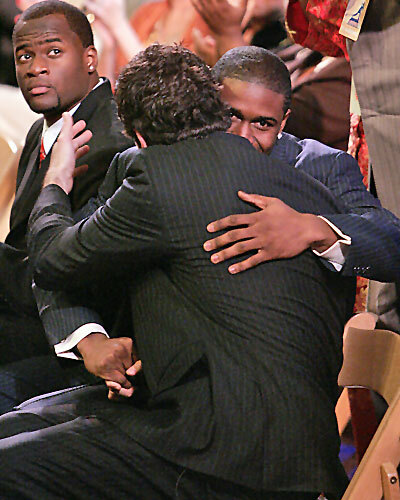 The 2005 Heisman ceremony was a turning point. Young desperately wanted to win the trophy but was beaten out by Bush by a comfortable 933 points. Vince Young: I was very upset about that. I was crying. I didn't want to do media. Coach Brown told me to do it. We already had two Heisman Trophy winners. I wanted to be a third. Bohls: I covered the Heisman ceremony and my lead was: 'Beware, USC. Be very afraid.' The Heisman folks told me they had never seen someone so upset after finishing second. That season, the Longhorns settled differences internally. Something called "The Storm" evolved. If teammates had a disagreement, the locker room doors would be locked, windows would be taped over so coaches couldn't see in. The combatants would then put on boxing gloves and have it out. Did the best player on the team ever lose, essentially get beat up in front of his teammates? Selvin Young: There were times Miss Sally [Mack's wife] would walk in on us, we were going at each other so much. She'd say, 'They're about to kill themselves.' It was literally like that every day. There was a different storm in Los Angeles. USC was the toast of the town. Playing in the Rose Bowl was a home game. The Longhorns were in Pasadena for the second straight year but were definitely made to feel like the visitors. Leinart: We're in our backyard; we had so much experience in those types of games -- the year before beating Oklahoma [in the BCS title game]. The year before that, we beat Michigan in the Rose Bowl. It wasn't our first rodeo. Brown: The media did not give Texas a shot in the game. It was USC and all that. I can remember even before the game sitting before the media. Vince Young on my right and Selvin Young on my left. Someone asked, 'Aren't you so tired of hearing how good USC is?' Selvin said, 'I watch the Cartoon Channel. I don't really pay attention to that.' Then they asked Vince the same thing. He said, 'You know I watch MTV.' We felt like USC was tired of [touring] the zoo, tired of Disney, tired of picture day and our guys were still fresh. Bohls: I think they were even comparing USC to the '86 Bears. Mack was very confident going into the game. The Horns had their own celebrity following. Roger Clemens and actor Matthew McConaughey were famously around the team. Texas fans can be as cloying as any. Brown: We took the kids to the stadium for team pictures and told them to pack for one night. Then we went back to a different hotel [before the game] and nobodyknow where we were. Sally didn't know where we were. Studdard: Coach Brown didn't have to give a pregame speech. The whole week the media was saying, 'They're the best team of all time.' All week that's all we heard. We were pissed off. Being in L.A., everyone talked trash to us. Everybody hates Texas. They all think we're soft, we're just given things. They think we have a silver spoon. That's what really drove us that year too. Brown: I sat in my hotel room and watched three 30-minute shows of Jerry Springer. I just didn't know what to say. The whole team is sitting there. I told the kids, 'No. 1, thank you for getting us here. This is fun. Fans are happy, parents are happy, administrators are happy. Faculty is happy. How many of you have seen the show Jerry Springer? I'm going to tell you something that's going to change your life and help us win this football game. I had 'em. I said, 'If your girlfriend or your wife asks you to go on Jerry Springer, don't go. It's not good, now.'' They died laughing. USC's vulnerability began to show on the second play of the second quarter when Bush inexplicably pitched the ball to walk-on receiver Brad Walker while running free in Texas territory. The Longhorns recovered, snuffing out a USC scoring drive if not a touchdown on that play. Carroll told reporters the day after the game: "If Brad latches onto that thing it would have been a play for forever, a play for ages. But it wasn't the right time to do it." David Thomas still holds the Texas career record for receptions, yards and touchdowns by a tight end. Still, few would have thought he'd have a major impact that night. The strapping 6-foot-3, 240-pound senior was the Horns' leading receiver vs. USC with a career-high 10 catches for 88 yards. Selvin Young: We had a thing, if we went to the national championship and won, David Thomas had to have a drink. The guy never had a drink his entire life. We made this bet a year and a half in advance. We know he's never lied to us. He just told us [the drink] happened. We knew we were going to take his word for it. The way he led his life was really an inspiration. But you better make sure you heard the whistle to stop, [because] he would knock you out. Six of Thomas' catches came as the Horns built 16-7 and 23-17 leads before USC rallied back and asserted itself. With 6:42 to go, the Trojans had come all the way back to take a 12-point lead. At home, in the Rose Bowl, with a forever team threatening to post the first three-peat in the sport's history, it looked like the Trojans couldn't be beaten. On fourth-and-2 from the Texas 45, Carroll decided to go for it clinging to a 38-33 lead with 2:09 left. Bush was left on the sidelines. Carroll didn't hesitate going with LenDale White, who had run for 124 yards. White was the "Thunder" part of the USC's "Thunder and Lightning" combo. On this play, Thunder was stopped cold. Ruel: The play before that, we were six inches from a first down but LenDale fumbled and we recovered. The game is so delicate and so fragile. You have to play every down as hard as you can go. That was his specialty. He very rarely got denied. Sarkisian: It was with no hesitation for LenDale to be the ballcarrier on that play. The third-down play is the one people don't talk about. He's right on the first-down marker -- if not on it -- and fumbles it backwards. Brown: I think Pete did exactly what he should have done. We just rolled the dice and [defensive coordinator] Gene Chizik did a good job of getting everybody to penetrate. We hit a 250-pound back in the backfield. I thought the criticism was unfair. It's what they'd done all night. At thatpoint we thought we were going to win the game. Bohls: Biggest faux pas of Pete's career, perhaps. The fourth-down stop fit right in with the shifting momentum of the game. As the final quarter ticked down Texas was clearly rolling. Everyone felt it. The only question was whether there would be enough time to finish the job. Brown: I could see SC was tired. One of the great things about Vince Young is he never got tired. I could tell they were frustrated but also tired at the moment. That's when Vince walked down and told the defense, 'Give me a stop.' I'd never seen him do that before. USC was definitely tired. Texas took 10 plays to go 56 yards to win it. Young's 8-yard touchdown scramble on fourth-and-5 with 19 seconds almost looked half speed. Carroll chose to blitz with six. Right defensive end Lawrence Jackson seemed to have a direct line at Young but was shoved out of the way by a Texas blocker. Jackson: I remember getting close. As soon as I got to him and reached my hand up, it's almost as if he stepped up at the same time. Left end Frostee Rucker dropped back as a spy but was taken out of the play just enough as Young breezed past. It was the final blow against USC's talented D-ends. Rucker had four tackles in the game. Jackson had none. Vince was at his best when he freelanced. Rucker dived at his ankles at the 3-yard line. Game on became game over. Jackson: It was literally like magic. One moment Young was there and the next minute, he wasn't. Make the play and win and [we] go on and be one of the greatest college teams ever. 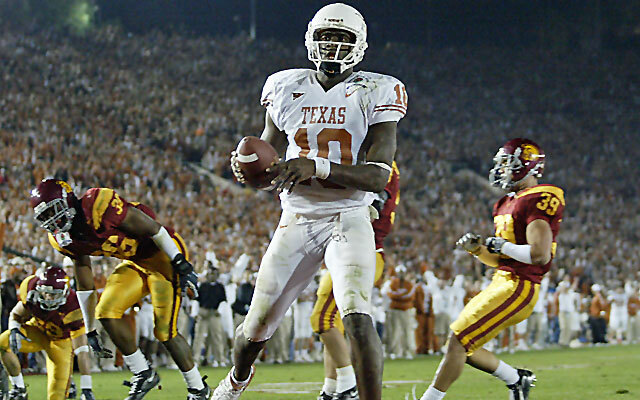 Vince Young's performance in Pasadena remains arguably the best in Rose Bowl history. His 467 total yards that night -- 267 passing, 200 rushing -- are the most ever in the Rose Bowl. Counting the previous year, Young accounted for 839 yards and eight touchdowns as a two-time Rose Bowl MVP. Davis: At that point in his career, he wasn't an athlete playing quarterback, he was a freak. 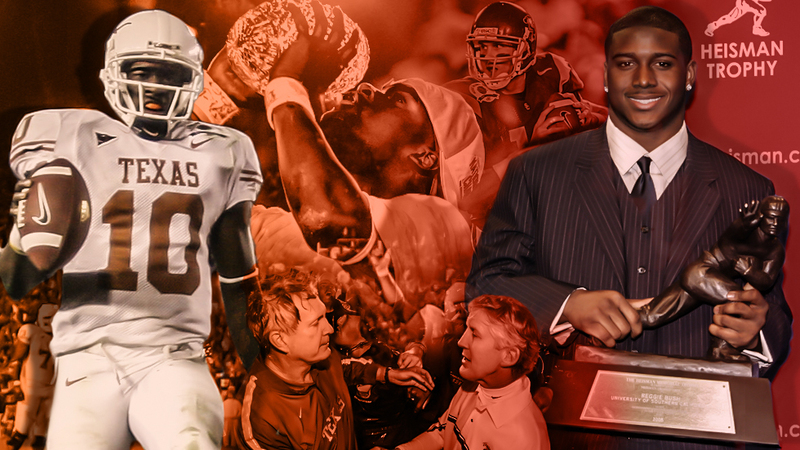 Bohls: Vince Young will always be remembered as the savior of modern-day Longhorn football. He's probably the the second- or third-most celebrated Longhorn behind Tommy Nobis and perhaps Earl Campbell. He returned Texas to the promised land. The transition from great athlete to great quarterback was slow and sometimes laborious. Young was actually pulled in a 2003 Holiday Bowl loss to Washington State during his redshirt freshman season. Davis: Vince comes in and says, 'I don't ever want that to happen again. Coach, you pulled me.' I said, 'If you would have been me, you would have pulled you, too. If you really don't want it to happen again you need to get in the film room.' Nobody could outwork him in the weight room. At the end of his redshirt freshman year, he began to do the same thing in the film room. Then went on and reached great heights. Selvin Young: I think the brilliance, the artistry of a Vince Young, it's almost like artwork that will sit there in history. At 9:25 p.m. PT, Texas won its first national championship in 35 years. In Brown's hotel suite afterward, NCAA No. 2 executive Tom Jernstedt cornered the coach telling him, "This is great for the NCAA. This is a clean team. Thanks for doing it properly." At the conclusion of the game, Selvin Young sprinted to the middle of the field and pointed to the heavens. The injury, the academic issues were in the past. Selvin Young: [At the previous Rose Bowl], I ran to the 50-yard line and fell on one knee. I asked God to show me a path, create a Yellow Brick Road. I want to play anywhere and win the national championship. When we won the national championship, it just happened I was in that same spot, literally crying, 'Thank you, Jesus.' I had a surreal moment that day that will last me the rest of my life. President George W. Bush called an exhausted Brown at six o'clock the next morning. During the call, Bush -- Texas' former governor -- admitted he'd gone to bed early but couldn't sleep, slipped down the hall and watched the last quarter by himself. Studdard: I was more in shock after the game. We get back to the hotel and I thought I was going to go party. I don't remember anybody going out. Everybody was so exhausted. I had a couple of cold beverages with my mom. At the next morning's press conference, Brown accepted every national championship trophy in existence. The whole thing continued to have a Hollywood feel to it. Down the hall, members of the 1966 Texas Western basketball team were promoting the film, Glory Road. Few people know that Charles' national championship ring was stolen. Studdard won't likely be having the same problem any time soon. Studdard: My ring is in my gun safe behind all my guns. Come get it. In getting back to Charles, the Chiefs running back has, at the very least, become one of the best NFL players to come out of this game, if not the best. If he can't get the ring that was stolen from him back, he is intent on replacing it with another one. Charles: I want to say when I die I won a championship in the NFL. Ruel, a career assistant who eventually followed Carroll to the Seahawks, best framed USC's counter perspective. Ruel: After the game, we got on the bus and we're heading back to our hotel. It's very solemn, very quiet. All the sudden, I'm looking up there's this blue-green thing flashing across the sky. Pete said, 'Did you see that?' First thing I thought was, 'Maybe it's the end of the world we're going to be hit by a huge meteor. It's all going to end.' That's how depressed I was. Seriously, I don't think you ever get over those things. I have a much, much easier time dealing with our Super Bowl [loss] than that game. Davis was sitting across from Texas legend Darrell Royal on his flight home. As the plane descended into Austin, Davis felt confident enough to tell Royal that in beating this USC juggernaut for the national title, the last accomplishment had been checked off his list of being a Texas coach, as if to imply everything from that point forward would be gravy. But that's the thing about winning on that kind of stage, in that kind of way: It only raises the bar. Expectations become unending. "When this plane touches down," Royal told Davis, "they're going to hand you another list." Such is the sobering reality that follows the high of having won on one of the grandest stages the football world has ever known: The game goes on. Life goes on. We all expected that the central figures of this game would go on to even greater heights, that this was merely the beginning, but that's not what happened. Yes, Bush has been a nice, if seldom great, NFL player. He won a Super Bowl. He's still in the league after 10 years, and that is nothing to sniff at, particularly as a running back. But he has never captured out attention the way he did in college. Back then, you could hardly believe the things he did on a football field. Same goes for Vince Young. Brown called him perhaps the greatest Longhorn ever. He was famously drafted in the first round and made two Pro Bowls, but things went south quickly and he was out of the league after the 2011 season. Since then, he has become more famous for frittering away an estimated $30 million fortune before going bankrupt. "I had some people around me that weren't in my best interests," Young said. "I had people around me that were interested in a check." Leinart? A classic bust as a pro. But while they were in college, the game revolved around them. They were must-see TV. Completely magnetic. Bursting with talent. And for one night, they got together on the same field and turned every bit of that talent loose. Like Vince Young said, we'd never seen No. 1 and No. 2 go at it like Texas and USC did that night. Ten years later it's even clearer that we may never see it again.